Last year Fujitsu released a 19" matrix, and everyone who welcomed the MVA was very pleased with that fact. It was not because of the diagonal (the matrices with a small pixel size are even preferable in some cases) - but because everything that was expected from this technology was realized. Potential advantages of the MVA couldn't be brought into life for a long time because of complex and high-cost production. Then the specs got better, and the prices competitive. That is why Fujitsu's decision to leave the PC matrix market was like a bolt from the blue. The actual reason was that the competition with the Korean manufacturers (Samsung and LG) made running business in this market sector low profitable. Fujitsu lost the segment of inexpensive displays yet last year, and bigger models do not bring so good income because they got much cheaper. The company thus focused on the TV-sets market where the prices were higher and the advantages of the MVA and MVA Premium were much more wanted in case of large diagonals. It's no good even if one firm leaves the market. In this case it had even a worse effect: it seemed that those who were aimed at a 19" matrix at the resolution of 1280x1024 were betrayed: Fujitsu was leaving the scene, AU (that produced matrices by the Fujitsu's license) could hardly provide the necessary quantity (besides, the AU matrices' quality was doubtful), LG had no plans for such matrixes and Samsung was focused on matrices of a smaller diagonal (which were always better than 18" and over). But then Samsung changed its mind and thought that it wasn't worth granting the market of large displays to LG and did its best to conquer it. Also, they thought that it would be nice to take the niche left after Fujitsu. Thus we got SyncMaster 191N and 191T which differed only in the DVI-D input integration. Why did they bring out the former model is not clear: 19" models belong to the budget sector (sub$1,000), but they have a long way to go to reach the low-budget level, that is why it's useless to save on matches. Besides, each display can have two types of supports: usual or rotary, that is why there are 4 models in all. We will examine today one variant - the model 191T with a usual support because the difference from the other models of the line is minimal. When I tested this model I also tried to find out more information on PVA, Samsung's new technology of matrix production, and what it has in common with the VA/MVA apart from the name. For comparison I used the Acer AL922 LCD monitor based on the Fujitsu panel. Continue developing the TN technology. Actually, this technology can manage 20", sometimes even better than others, but what will be next... At least, no one produces 22" and over TNW matrices. License one of the existent technologies, in particular, MVA or IPS. LG did that quite a while ago and has mastered both technologies, that is why it could be a problem to catch up with the main competitor. 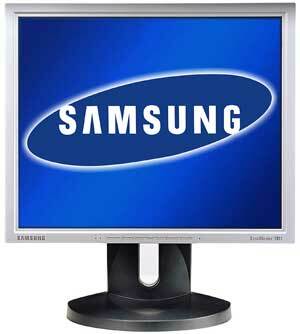 Samsung chose the third way, though it looked scaring: if something can be invented why hasn't it been invented yet? ;) Thus Samsung gave birth to PVA. How this technology works is difficult to find out because if you enter Samsung site you can see that absolutely all monitors are based on the PVA technology. I could find the only difference from MVA in the technical documentation: when the power is off the molecules are oriented at the right angle not only to the low filter, but to the upper one as well (i.e. a part of them is at the right angle to the upper one, the others are to the lower one). Anyway, this difference is enough not to pay the license fee and get the main advantages of the MVA. However, brightness and contrast must be inferior to the MVA, and the time of switching between colors other than white and black must be greater. We will check that out. At least, the matrices from Samsung and Fujitsu have identical specs. However, such specs do not look impressive (even in case of latest TN matrices). The monitor looks massive, though it isn't more difficult to carry it by Subway than Acer's one. It looks so huge because of its monumental support. The monitor inherits the design from the N series: a thin silvery or black framing, 6 thin buttons including the on/off button which doesn't differ from its neighbors (that's very nice when you accidentally press this button instead of the Menu one:(), and 3 LEDs: one shows the monitor status and the two others indicate the signal source used - analog or DVI (in the 191N they are a contribution to saving of the production costs). You can switch between them in the menu which is arranged like in other monitors of this firm. Such design doesn't allow for multimedia features because there is no space for speakers. But that's not a problem, I only wish that it had a through audio-out. Let's see what we have behind. There are only three unprotected connectors underneath behind the support. It makes connection of cables a bit difficult. But if the width is that important and the support is mounted exactly this way, there is no choice left. But I wish the connectors had caps on. Now a little on the support. As I mentioned above, there are two variants. One makes possible to turn the monitor to the portrait mode, the other can adjust its height. But none is not that necessary for monitors of this class: rotation can be useful for 15" monitors for word processing, and on a standard desktop the monitor in its lower position is even a bit higher than needed (the eyes must be at the level of the upper edge of the screen, while in case of the SyncMaster 191T they are lower). Both supports look very massive. It's especially difficult to turn the monitor around the vertical axis. The previous testers forgot to put the power supply unit into the box, and in that way they rendered Samsung a bad service, otherwise I wouldn't notice that the company uses non-standard power supply units. Until I waited for it to be delivered I tried others and understood that it was a problem to find an appropriate replacement: in Samsung monitors the power supply units generate 14V current while generic models generate only 12V or 12.5V. This is actually a standard of most manufacturers. I advise that you use them very carefully to avoid misoperation (the 3-year warranty for the Samsung equipment doesn't cover power supply units). So, in spite of an external unit used in this model, its nonstandard implementation makes it as unreliable as an internal one. The most vital fact affecting customer's choice is not appearance or functionality but how a given display manages its functions. No secret that MVA monitors have a brighter, more contrast and juicy picture than TN in spite of the same specs. Since I didn't find much difference between the MVA and PVA (using the information provided by the manufacturers) I expected the same effect from the 191T. But the image turned out to be dull, colors were unsaturated, only the brightness levels were identical at the same settings. However, one of the MVA's disadvantages wasn't found as well, which is too cold colors even at low color temperatures. At the same time, dark gray is used instead of black like in many 15" MVA matrices. First I thought that it needed just a slight adjustment of the settings. But I spent several hours to adjust the colors and failed. The MVA and PVA have probably much more difference than I thought. That is why the color rendering of the PDA is much closer to the TNW than to other technologies. The viewing angles are not that bad, but the advantage over other monitors if you use them in a usual way (i.e. looking directly at them) is not that great. However, there are some strong points, for example, the colors start melting away at 60-65 degrees while some other models can have it at 50 degrees. Now the most thrilling part of our story. When Samsung announced the PVA it said that the pixel switch time would be lower. Soon those promises were forgotten and the response time disappeared from some Samsung's site and from the specs supplied to the monitor. Maybe, 25 ms is supported, but only as a part of the full response time. The performance of this monitor in games reminds the LG MVA released two years ago with their classic 15:25. However, 40 ms is acceptable for 3D games, but is it worth doing playing? So, the monitor has no chance in dynamic images, even if compared with universal models (I don't mention fast TN models at all). The only task left is word processing :) Graphics needs better colors, dynamic games need a higher pixel response time, but office applications can do with the 16bit color (in this case the color rendering is a bit better) and the switch time of 40-50 ms, and a big pixel is a big advantage. The speed is amply for movies as well (in contrast to Samsung LCD models of 21" or 24" which make blurry images when playing DVD movies), and wide viewing angles are very useful. When the 191 series was just released, it had a good advantage over many other monitors even of a smaller diagonal. The price. But after the spring pricecuts for 19" MVA monitors it turned out that only iiYama maintained the price of over $1,000, while similar models of other companies fell down to $800-900, and that immensely influenced the market. If have a year ago we could shut our eyes to inferior quality of PVA models because of a much lower price, the today's price gap is not worth it. So, the purchase of the 191T becomes doubtful. The time will show whether it's considerable problem of the technology or it can be eliminated, like the loopholes in the MVA and IPS, but at the moment Samsung's attempt to enter this market segment is not successful.